Postal address: PO Box 192, Hurlstone Park 2193. 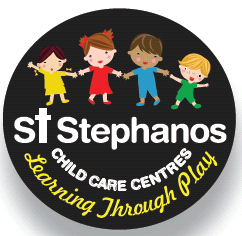 St Stephanos Child Care Centres 1 & 2 are located at 648-654 New Canterbury Road Hurlstone Park 2193. We are affiliated with the Greek Orthodox Archdiocese of Australia and welcome families from all cultural backgrounds. We are an accredited Long Day Care Centre servicing the Hurlstone Park area for over 15 years. We cater for babies - 6 year olds and are open between the hours of 7.30 am until 5.30pm Monday to Friday. Centre 1 caters for 29 children per day and Centre 2 caters for 39 children per day. We are open for a minimum of 48 weeks in the year and close between Christmas and New Years. Our staff are highly qualified, long serving Child Care Educators that represent a variety of cultures and life experiences at the Centre. We would like to respectfully acknowledge the Cadigal Wangal people who are the Traditional Custodians of the land on which we stand. Our Centre reflects the diversity and richness of the local and extended communities that our children, families and educators belong to. By being inclusive and recognising the differences and similarities between people, we aim to connect with our communities and achieve a harmonious coexistence. A child’s development and learning begins with their family. We value these family relationships and aim to bridge the gap between the child’s home and the Centre. We actively seek opportunities for partnerships with families, to enable children to make connections between prior experiences and new learning. At St Stephanos Child Care Centre, we are responsive to children’s individual needs and provide a warm, nurturing and caring environment that fosters a strong sense of wellbeing in each child. There is a genuine respect and appreciation for children’s thoughts, feelings, ideas and interests and these are supported and extended through our programme.